Leading Manufacturer of pump gears from New Delhi. 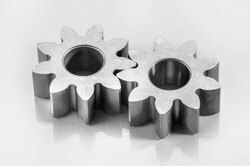 With highly driven technical excellence, we have been able to offer a wide assortment of Pump Gears. The pump gears offered by us are manufactured by using basic material that is taken from most reliable sources in the market and as per the set market norms.